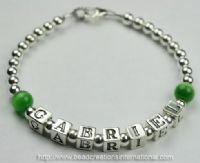 This Name Bracelet has a simple, elegant design. 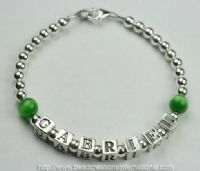 It features Sterling Silver Letters, Clasp, Sterling Silver Round Beads, Green Cat Eye Beads. This price is w/ up to 6 letters all other additional letters will be $2.50 each.